You want to create a report of your own that is not similar to any of the built in ones (in which case just create a new one). Once you have done this, you will be able to click on the 'Edit' link for the report which will display a list of formats, sections as well as the header and footer of the report. Active -﻿ This simply marks whether this report is ready to be used (active) or not. 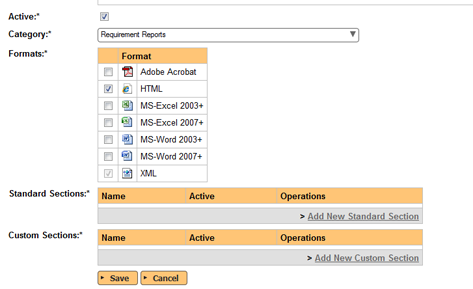 Formats - All of the Spira reports are generated first into HTML and then converted into one of the other formats. This section lets you choose which formats your report will be available in. Note that if your record has a lot of textual data, it may not convert well into a tabular format such as Excel. On the other hand, a ﻿custom section﻿, lets you use a custom database query using the Microsoft Entity SQL (ESQL) language to query the different database view in the system join records, aggregate data to generate a completely custom table of data that you can then transform using an XML template (XSLT) to display it in a specific form (e.g. a table of data, a simple list, etc.). So you have the ability to two two tools: ESQL and XSLT to generate the report. The advantage over the standard section is that you are not limited to the queries that we have already defined in the system, but a custom section does not provide filter options for the end user. A report you create can have a mixture of the two sections, for example you could start the report with the standard project name and description and follow that with a custom section that displays a table of custom data (e.g. a risk cube or other table of data). ﻿﻿In the next installment of this series we shall be taking one of the standard reports and using the standard section XML editor to make some changes to the XSLT template to hide some columns and add a new calculated column.